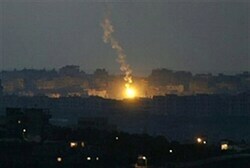 IDF fire killed 4 members of a Gaza rocket launching cell, and wounded four others, as tensions in the Gaza belt region escalate. The IDF shortly after noon on Friday identified a terror squad in Gaza preparing to fire rockets into Israel and scored a direct hit. The Bethlehem-based Maan News Agency said four people were killed and four were wounded in the attack. The strike came less than an hour after terrorists, also operating in northern Gaza, fired several mortar shells into Israel’s Eshkol Regional Council. No physical injuries or property damage was reported in the attack. The escalation comes on the heels of a pre-dawn gunfight at the Gaza security fence with a terrorist believed to have been sent to abduct a soldier, which left one soldier and the terrorist dead. The soldier, Sgt. Nathaniel Moshiashvili, 21, of Ashkelon was killed when his unit from the Golani brigade responded to a report that a terrorist had infiltrated Israel’s south. Moshiashvili was killed when the terrorist, who had taken advantage of a thick fog to pass into Israel, opened fire. IDF artillery soldiers responded, killing the terrorist. A subsequent IDF investigation revealed the slain terrorist had used night vision equipment in the attack, which was intended to be a kidnapping of an IDF soldier. “After the penetration, the terrorist identified and observed IDF units operating near the Gaza security fence,” Hermoni explained. The troops “Acted decisively, despite being under fire. We are fighting a constant battle against terror groups… The soldiers prevented a terror attack,” Hermoni said.